The classic New England setting of Old Saybrook combined with a Five Bell Marina and AAA four-diamond rating make Terra Mar Grille an obvious addition to our list. Boats up to 200 feet can pull up to either a fixed or floating dock in the marina, and guests can wander up to the restaurant while admiring the beauty of the Connecticut River and Long Island Sound. Smart-casual attire is required, and you should make a reservation for Sunday brunch to sample the variety of gourmet choices, including Belgian waffles, eggs Benedict, pastas, salads, and a dessert buffet. Executive chef Jim Gallagher creates regional American cuisine using local seafood and produce, and the dessert menu has such devilish options as the chocolate almond quartet (white chocolate truffle, double chocolate almond bark, amaretto petit four) and a sparkling lemon sorbet float. 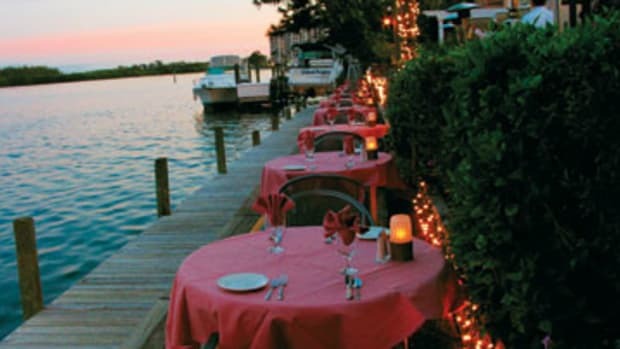 Terra Mar Grille is Gatsby decadence overlooking Long Island Sound.